Every Wednesday, all three Buco Pizzeria & Vino Bar locations (Epcor Tower, St. Albert and Windermere) feature a Date Night three-course chef’s choice meal for just $32. Last week, chef Spencer Thompson transformed the weekly Date Night menu at the Buco Epcor Tower location into a Taste Alberta Prairie on the Plate menu featuring an assortment of ingredients from across Alberta. To kick things off, diners were treated to house-made tortellini with ricotta, spinach, and Alberta-grown dandelion greens. The pasta was served alongside chicken sausage, made by their sous-chef Michael who is also a butcher, along with Sylvan Star Grizzly Gouda, pickled pine nut butter, and shaved apples. I’m told sous chef Michael spent over 20 hours prepping the Alberta Pork main course. He had to source pork trotters from a number of different Alberta pork farmers, which he braised, and then deboned. Chef Michael then made his own pork sausage using the trotter along with pork belly and shoulder, which he stuffed back into the trotter skin. To help keep the round shape, he wrapped the stuffed trotters in caul fat. The trotters were sous-vide and then pan fried (rendering off the caul fat), and resulting in a crispy stuffed pork trotter that was packed with flavour. The dish was complimented with Blindman Brewing session ale (from Lacombe Alberta) mustard, new potatoes, grilled vegetables, and green goddess dressing. Peas on Earth carrot cake slathered with Fairwinds Farm goat cheese icing, local honey sponge toffee, and chocolate soiles. For dessert, chef Thompson wanted to make it feel like diners had to dig in the garden to get to their dessert. First, Buco Epcor Tower’s pastry chef Jocelyn baked a carrot cake using Peas on Earth Organic Gardens carrots. The dessert was delivered in butcher’s paper wrapped jars stamped with the Taste Alberta logo. 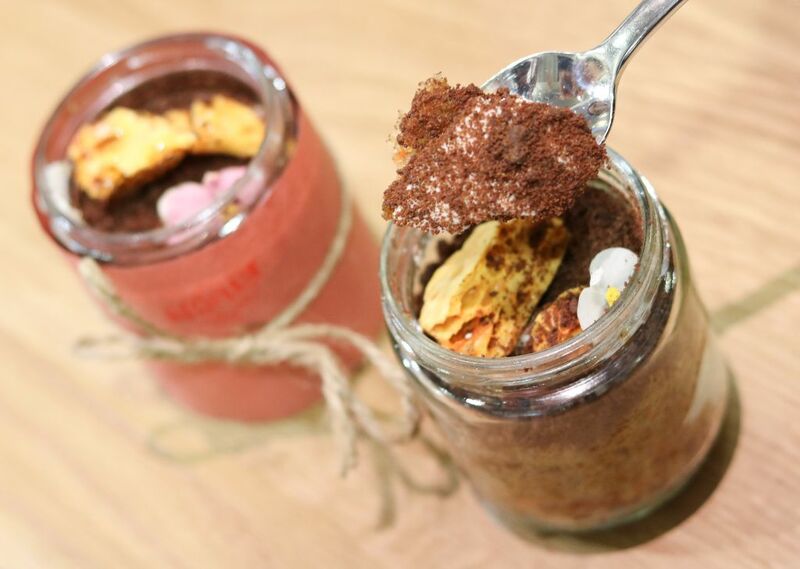 Once unwrapped, the jars displaced the carrot cake mixed with Fairwinds Farm goat cheese icing, dehydrated chocolate brownies made into soil-looking chocolate crumbs, sponge toffee made with Sturgeon County honey, and toped with edible flowers from Reclaim Urban Farm. With Shania Twain in town that night, Buco Epcor Tower’s culinary and serving staff had a busy evening between serving up Taste Alberta Prairie on the Plate dinners as well as concert goers. I love a deal – so I was thrilled when chef Thompson agreed to transform their weekly date night dinner into a Prairie on the Plate dinner.